controlling-pollution: Can carbon nanotubes clean polluted water? Water pollution is big issue in many countries of the world, particularly developing countries. One of the possible solutions which could be used to clean polluted water are also carbon nanotubes, according to the scientists from the University of Vienna. The Austrian scientists have discovered that water pollutants have very high affinity for carbon nanotubes which means that pollutants could be removed from polluted water by filters made of this carbon nanotubes. There are several advantages of carbon nanotubes which could be quite useful to clean polluted water, such as for instance a very large surface area that has a high capacity to retain large amount of pollutants. Nanotechnology is still a brand new technology that has just started developing and despite having enormous potential will still need time and lot of studies before being widely and cost-effectively used. This study is really only a beginning and scientists still need to find many answers in order to successfully use carbon nanotubes to clean polluted water. 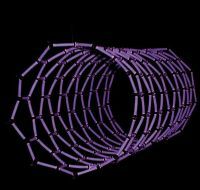 First of all scientists need to learn the behavior of carbon nanotubes in the environment. This is essential before they can be used in water filters to clean polluted water. The efficacy of each water filter varies according to the quantity and type of contaminants present in water. If there are many different pollutants in water some pollutants may not attach to carbon nanotubes so scientists still need to heavily research the mechanisms of sorption. Around one billion people in the world lack access to safe drinking water. Who knows, in years to come, perhaps nanotubes will change this negative number for better.